Ruby, sapphire, emerald, amethyst… you'll find all of the precious stone effects in this collection. 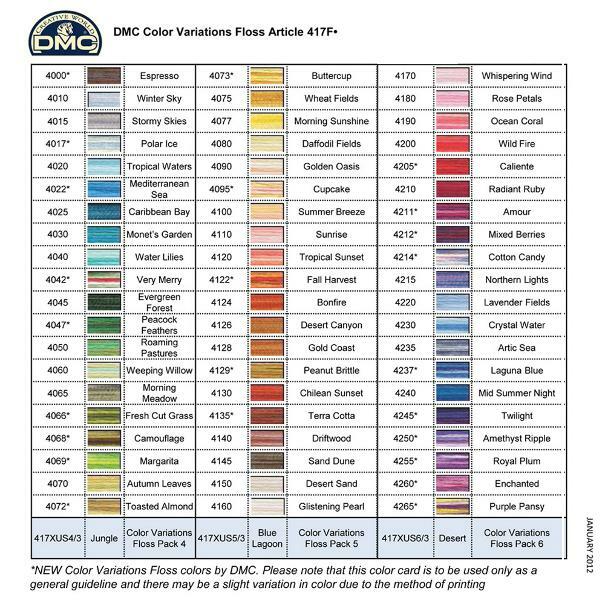 Plus, there are two multi-colored threads, Gemstones and Golden Dawn, which are exclusive to DMC and very unique in their colouring and stitched presentation. Ideal for stitching pieces where a glimmering sheen is desired, or for elements that naturally reflect light such as water, precious stones and more. Pastel, pearly, iridescent tones, ideal for delicate effects on baby items, special occasion pieces, or romantic themes, wherever a soft accent is desired. Designs picturing natural effects such as pearlized seashells, the morning light, delicate flower petals … they all reflect these gentle tones. Two luminous shades, green and yellow, which add a bright look to any project. Great for kids' items. And with Back Stitching done in black around the fluorescent threads, a very dramatic effect can be achieved. An innovative new thread that lights up the night! After being exposed to light, this white thread delicately glows in the dark. A must for fun, bright projects, and kids will love it. Pearl Balls size 5 is available in 5 solid colours on a 49 yard ball. Size 8 is available in 206 solid and 18 variegated colours on an 87 yard ball. Size 12 is available in 40 solid colours on a 131 yard ball. 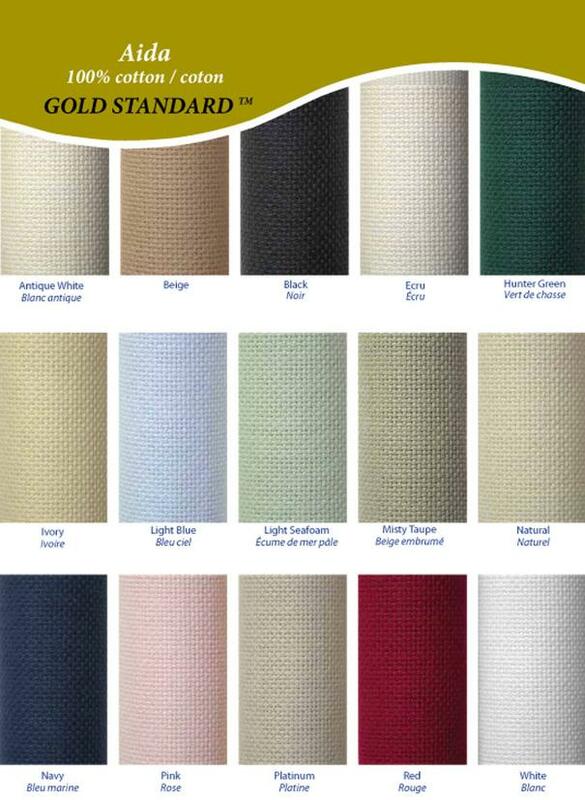 Charles Craft Gold Standard Aida is a high quality cross stitch Aida fabric woven from 100% cotton yarn, produced especially for Aida. Gold Standard Aida is up to 33% heavier so it can be stitched without a hoop. 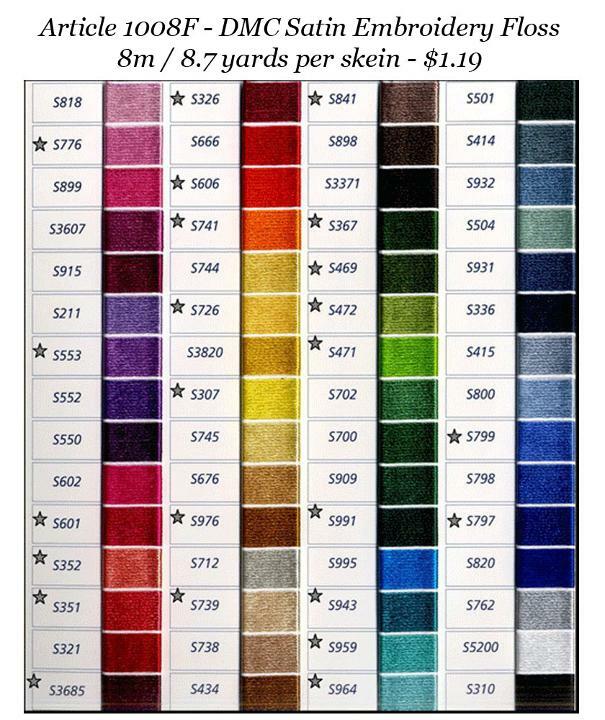 Charles Craft Gold Standard Aida is available in 11-count, 14-count, 16-count and 18-count in numerous colours and cuts. Made in North Carolina, USA of locally grown Southern cotton. 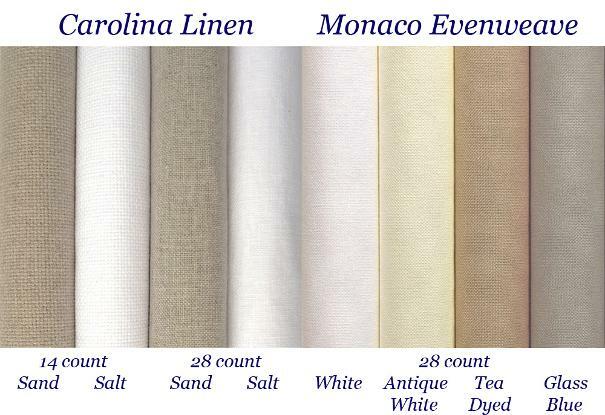 An easy to use Evenweave fabric with refined qualities and the ease of 100% cotton. 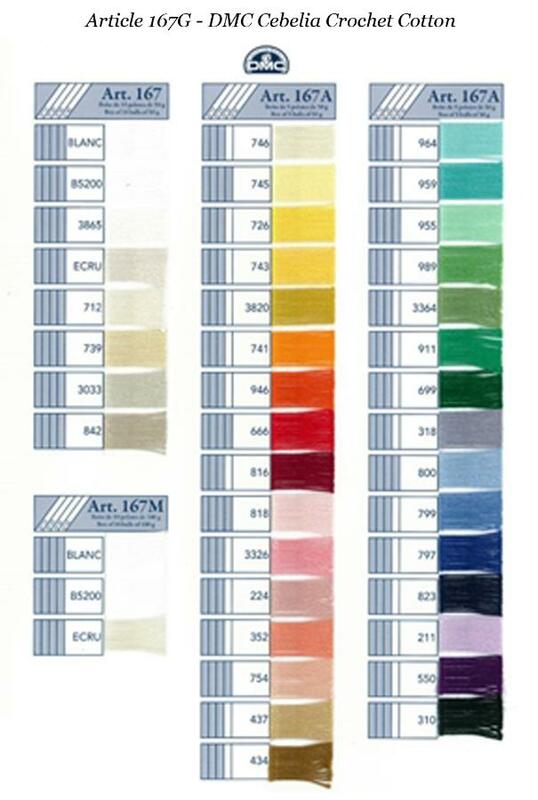 Perfect for cross stitch, machine embroidery, punch needle, ribbon embroidery, crewel and stamped designs. Monaco 28-count can be stitched over 2 threads. Made in USA. 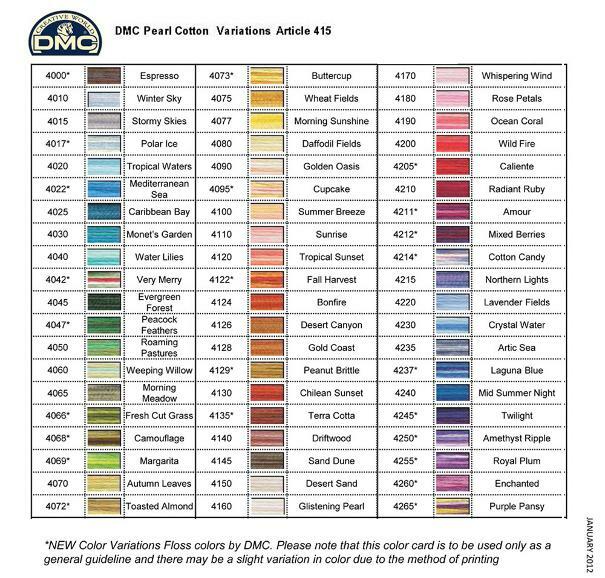 A set of pre-printed, self-stick labels that identify all DMC Specialty Threads by type and colour number. 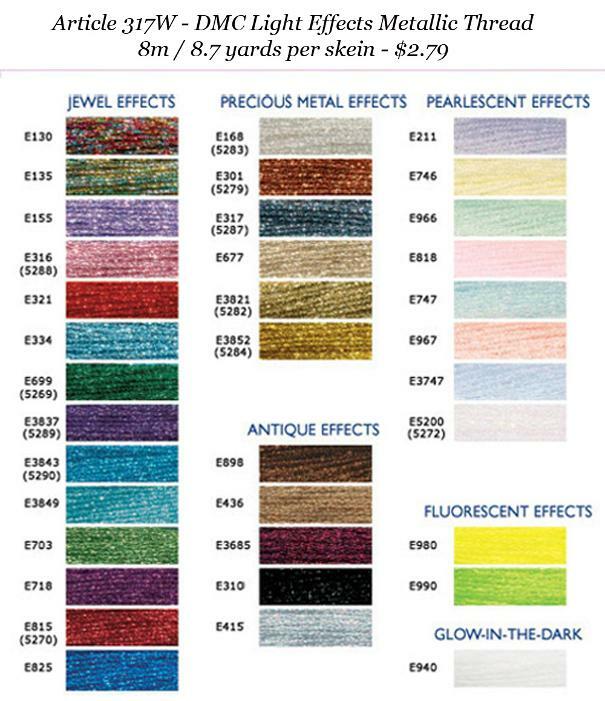 Includes labels for all shades of DMC Embroidery Floss, Light Effects, Colour Variations Floss, Pearl Cotton in Size 3 and 5, Pearl Cotton Variations, and Rayon Floss. Package contains 1,400 labels, including extra blank labels for customized use. 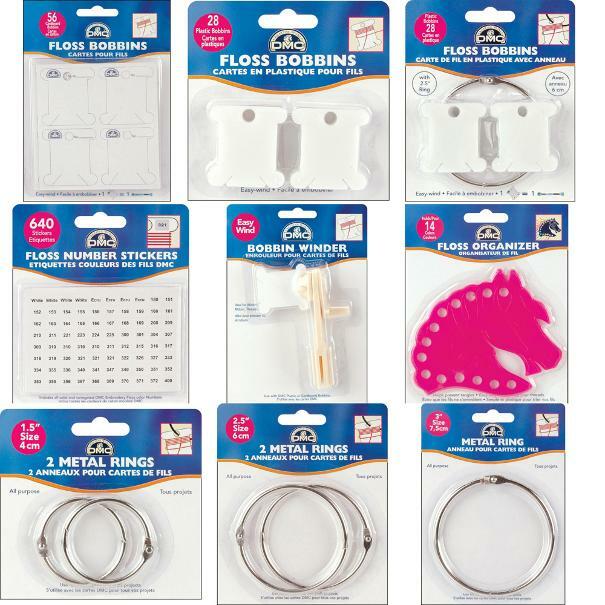 Each label is 1/4" by 2" in size, and folds to 1" when wrapped around metal storage ring.